Last week’s other top-gaining mining stocks on the TSX were Valeura Energy, Aquila Resources, Liberty Gold and Oryx Petroleum. The S&P/TSX Composite Index (INDEXTSI:OSPTX) dropped Friday morning (November 30), down 39.8 points from the previous day to 15,154.24. The weak start came as a result of slipping oil prices, which weighed down the energy sector. By midday, Canada’s largest exchange had recovered some of the loss following the signing of the North American trade agreement between Mexico, Canada and the United States. The three countries signed the deal on the sidelines of the G20 Summit, the pact between the three nations boded well for the Canadian economy. The TSX sat at 15,166.63 at 1:50 p.m. EST. 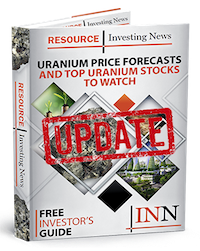 Laramide Resources is an uranium exploration and development company with assets in both the US and Australia. The projects Laramide targets are considered late-stage uranium developments with good grades and low risk. The company did not release any news this week. Earlier this month, Laramide completed the purchase of the Australian Murphy project from mining major Rio Tinto (ASX:RIO, LSE:RIO, NYSE:RIO) for AU$450,000. Laramide shares were up 21.62 percent to C$0.45. Valeura is a Canadian petroleum and natural gas company, focused on exploration, development, and production in Turkey. Valeura made no company announcements last week, however Valeura did release its Q3 results. Company stock grew by 14.24 percent, trading at C$3.69. Canadian diversified explorer Aquila is engaged with developing its wholly-owned Back Forty zinc and gold project in Michigan. While Aquila has not posted any news for late November, the company did release its third quarter results at the beginning of the month. Aquila shares ticked up 11.76 percent, to C$0.19. Precious metals miner Liberty Gold is currently exploring the Great Basin in the United States, home to a number of large-scale gold projects. The Great Basin region is one of the largest gold-producing regions in the world stretching across Nevada, Idaho and Utah. Last week Liberty released an upgraded operations plan for its Goldstrike project, located in the Great Basin. Stock in Liberty gold was up 10-percent for the week, to C$0.33. Oryx Petroleum is an oil exploration and development company with ongoing projects in Africa and the Middle East. The company has acquired interest in seven license areas since it was established in 2010. The company made no announcements last week. Stock was up 10 percent, trading at C$0.22.